Have you been searching for car dealerships in Columbus, Indiana that offer a great variety of used minivans, used SUVs, used trucks, and used cars in Columbus, IN? When it’s time to decide on what your next vehicle is going to be, do you know which Chrysler dealer in Indiana to go to? Acra is the only family of car dealerships in Columbus, Indiana, Greensburg, Indiana, and Shelbyville, Indiana that you need in your search for a full inventory selection of used cars in Columbus, Indiana. The Acra Auto Group has such an expansive range of used cars in Columbus, Indiana to choose from at our Chrysler dealer in Indiana. With such a complex variety, the selection they provide should be able to please almost anyone's taste. At the Chrysler dealer in Indiana of Acra Auto Group, we have a significant amount of brand-named automakers at our car dealership in Columbus, Indiana. We aim to provide the best-used car shopping experience around. With such a large selection of vehicles, it's no wonder people all over Indiana pass up other Chrysler dealers in Indiana to come to the Acra Auto Group car dealerships in Columbus, Indiana to find the perfect used vehicle that fits their lifestyle and their budget. It doesn’t matter if your family is large or small, used minivans for sale at Chrysler dealerships in Indiana are always a great vehicle to consider. Minivans for sale from Acra are not only a great vehicle to haul your family in around town, but they are also great for long road trips! If you have pets, they will have room to roam. Also, storage space won’t be a bother if you keep them crated. Not only that, kids have the space to keep their hands to themselves. You can even find used minivans for sale that come equipped with rear entertainment DVD players. Rear entertainment DVD players are wonderful on long trips to keep the rear passengers occupied. Because used minivans for sale come equipped many different ways, you can easily find the used minivan that meets your needs here at Columbus, Indiana car dealerships of Acra Automotive Group. Since everyone has a different idea of ideal features that are required to make a used minivan for sale perfect for them, you will find that our used minivans for sale in Columbus, Indiana are equipped many different ways. Whether you are looking for cloth or leather seats, we have you covered. You can also find options such as heated driver and front passenger seats, or even multi-zone climate control. 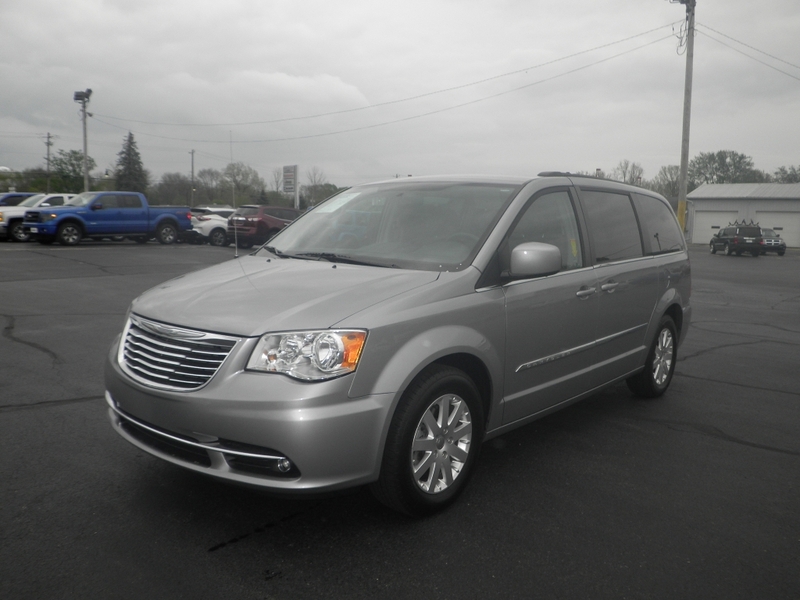 Like on the used Chrysler Town & Country Touring at Acra Automotive Group. This used minivan for sale offers cargo space behind the 3rd-row seats which give enough room for larger items or luggage even with all seats occupied. If you need extra space for oversized items for your hobbies or kids sports equipment, you can quickly fold the 3rd-row seat flat in this used minivan for sale to give you extra room for your things. Power windows, power door locks with remote keyless entry, a power rear liftgate for easy access to the rear cargo area, and a remote engine start are also great convenience features on this used minivan for sale at our Columbus used cars dealership. Do you travel to a lot of new areas? Then this is the used minivan for you because it has a built-in navigation system. Travel for hours on end without the worry of going over valuable cell phone data. We understand safety features are top concerns for just about every car buyer, not just our local Columbus, Indiana used car dealerships buyers. That is why you will find an abundance of safety features on this used minivan for sale. Such as multiple airbags, child proof locks, anti-lock brakes, a rear backup camera, and backup sensors. Come and check out this used minivan for sale today and take it out for a test drive down the streets of Columbus, Indiana. Whether it is used minivans for sale, like this used Chrysler minivan for sale, or another one of our family-friendly used cars, trucks, or SUVs, the Acra Automotive Chrysler dealership in Columbus wants to be the used car dealership that you choose for your next vehicle. Find out why we are the only Columbus, Indiana used car dealership you need to go to when looking for used minivans for sale at used car dealerships in Columbus, Indiana. Contact us today at 888-356-2272 to schedule a test drive of this used Chrysler Town & Country 4dr Wgn Touring! Or stop in at 2820 North National Road Columbus, IN to check it out in person!